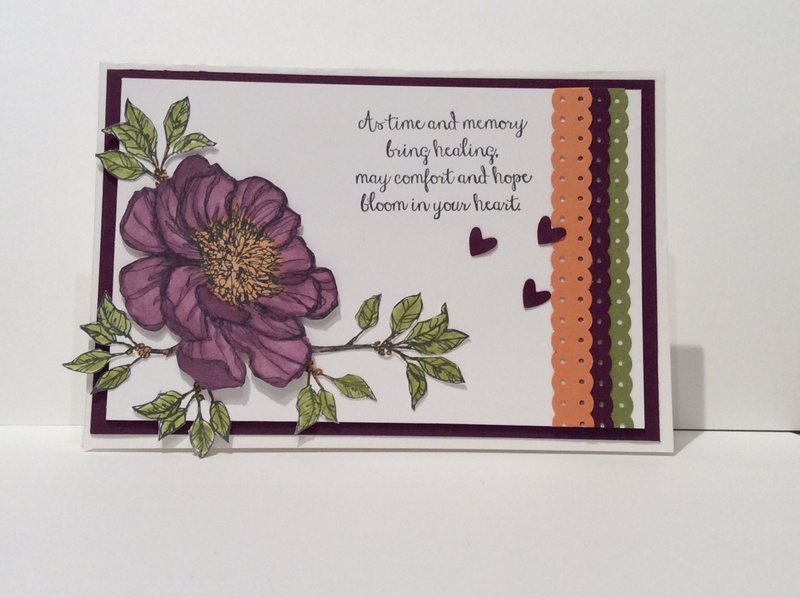 If you read below you will understand why I am still adding card made from ‘Bloom with Hope’. I have used Blackberry Bliss, Old Olive, and Pumpkin Pie. Since receiving a huge lot of new stamps, colours and punches from the new catalogue I have set myself the task of making at least two cards from every new stamp set. Eventually the aim is to own all the stamps from this year’s catalogue and have cards that showcase all the beautiful images and sentiments. So I have made a start on ‘Bloom with Hope’. Below are two cards using one of the images and the same sentiment. Actually, I have just realised that even for this stamp set I will need to make at least another three cards just to cover the flower/bloom images and then on top of that there are four sentiments still to use. But that’s ok, if I work diligently and creatively I am sure that some ideas will flow. The above cards use Rich Razzleberry, Pool Party and Whisper White as the colour combinations. 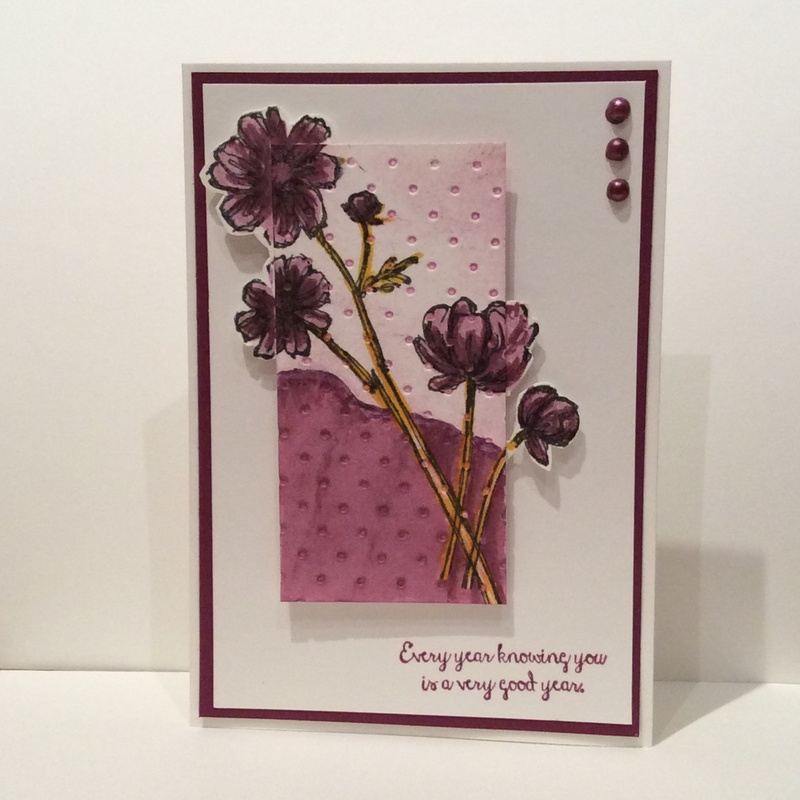 On the top card I have used Blendabilities to not only colour the flower images but to change the hue of the pearls. To provide texture, both cards have an embossed rectangle using the Perfect Polka Dots textured impressions embossing folder. I opened the folder prior to putting the whisper white card stock in and sponged the folder with Rich Razzleberry. Once the card stock is embossed it leaves a lovely light shaded card with the embossing accentuated. i just love using the Blendabilities and my personal preference is to use the brush tip end. I like the feel as if you are letting the ink flow, rather than stroking the pen on the card stock. 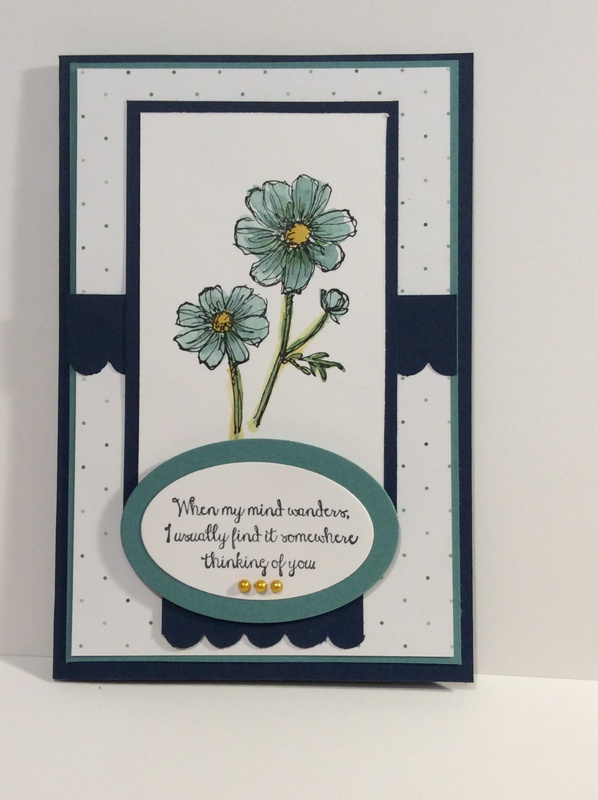 For the second card I have used the Petite Petals punch, stretched the card stock with the Bone Folder to break the paper fibres, split the cutout and pinned together using Mini Brads to hold the flowers together. I have used Pool Party Seam Binding Ribbon, but as this is not a current ribbon embellishment I would suggest using the Organza Ribbon or Pool Party Cotton Ribbon wrapped around the card a couple of times. On the bottom card I have also used The Deco Label Framelits and the Modern Label punch. I am going to leave this post for now, but I will comeback and continue to add to this one as a work through the Bloom with Hope stamp set. 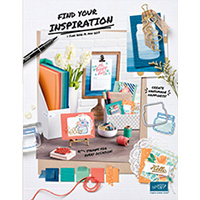 You can always order through my website if you would like to purchase any of the Stampin’ Up products. It is very simple and so convenient to order and pay online and then have your goodies delivered to you. Sometimes just being simple works. In this next card I have used the Flowerpot Designer Series Paper coupled with Night of Navy, Lost Lagoon and Garden Green with a little Hello Honey for the flower centres. I’ve used a water colour technique with StazOn ink. I haven’t purchased any Night of Navy ribbon yet so I used the Scallop Edge Border punch to add that embellishment that was needed. I have also coloured the pearls with Daffodil Delight Blendabilities. 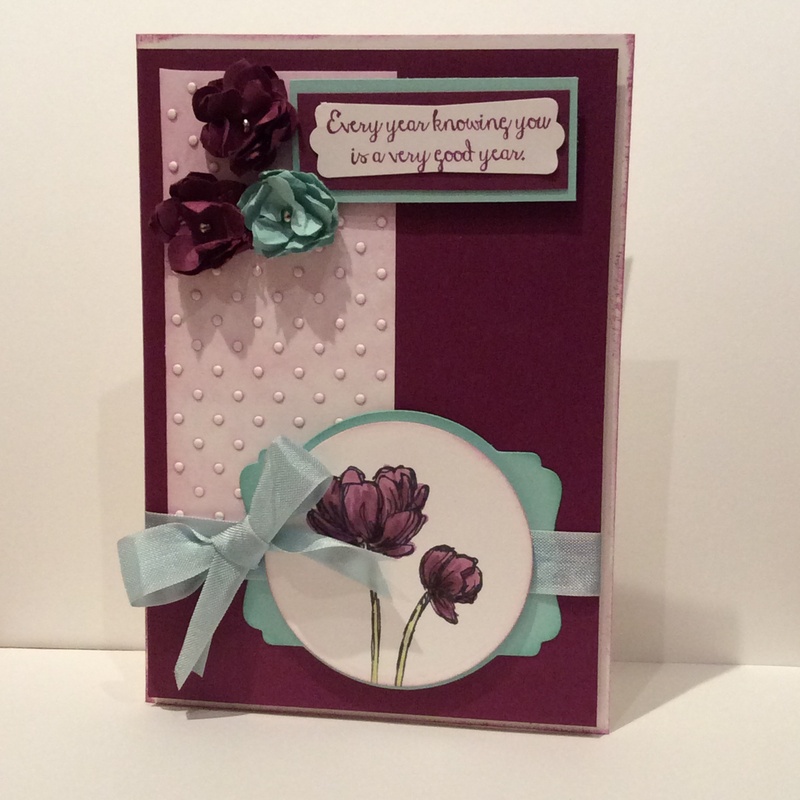 This entry was posted in Bloom with Hope, Mum's Posts, Stampin' Up! and tagged Blendabilities, Bloom with Hope, Deco Label Framelits, Petite Petals, Pool Party, Rich Razzleberry, Stampin' Up!. Bookmark the permalink.